The Los Angeles School Police Department (LASPD) is the largest independent school police department in the United States, with over 350 sworn police officers, 126 non-sworn school safety officers (SSO), and 34 civilian support staff dedicated to serving the Los Angeles Unified School District (LAUSD). 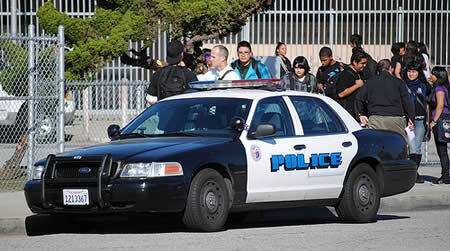 It is the fifth largest police department in Los Angeles County, and the 14th largest in California. Unique to the LASPD team is the variety of assignments and services it delivers to its customers: the students and faculty at the schools, the employees of the LAUSD, and the communities in which the students live. Our Police Officers are assigned to school campuses and also patrol the surrounding areas. Our School Safety Officers are also assigned to school campuses and parking enforcement. The LASPD also shares jurisdiction and interacts with over 13 municipal and county law enforcement agencies (to include multiple outside agency divisions and stations), as well as state and federal law enforcement and emergency services agencies. The LASPD team is a progressive and forward-thinking organization enjoying the support of the LAUSD Board of Education, Superintendent, staff, and parents who recognize the important role the LASPD plays in keeping their children and students safe. LASPD personnel concentrate their policing efforts on improving campus safety and creating safe school passages for students, staff, and school community. The goal of the LASPD team is to address the quality of life issues that impact student safety and the ability of the students and staff to enjoy a safe learning environment free from the fear of crime. Our team is also committed to ensuring a safe school community as we partner with local municipal law enforcement agencies, residential and business communities, faith-based organizations, and various non-profit community-service organizations.